Adobe Creative Suite is specially designed for the web design service professionals to create pages/templates/images for print, insert in web templates, videos, and everything in between and it is re-engineered to make the work quickly and powerful than before. It is a collection of Adobe Bridge, Contribute, Adobe Device Central, Dream Viewer, Encore, Extend Script Tool Kit, Extension Manager, Fire Works, Flash Builder, Flash professional, Illustrator, Indesign, Media Encoder, On location, Photoshop, Pixel Bender Toolkit, Sound Booth. New version of Adobe Creative Suite CS6 contains the Content- Aware-Move-Tool, Extend, and Patch Tools are improved than the previous version. High quality Video footage editing in both Standard versions and Extended versions, for so many formats makes it awesome. In Photoshop the new Face Detection and Skin tone mask features are auto Generated. An advanced color grading based on Lumetri Deep Color Engine makes CS6 as unique. Blazing-fast FTP performance, Fluid grid layout, pure CSS3 transitions. Replication and Movable shadows in 3D, auto-recovery, Dozens of user-inspired improvements. One click correction makes Adobe CS6 easier to use. By use of GPU performance is increased. Looks great by its 20th Century features. Brushes are added to make the user to create realistic and live pictures. Ups and Downs are done on Styles – Text/Character/Paragraph. Adaptive wide lens correction to remove distortion and straight lines in images. Crash recovery and Auto save are added advantage. Export into Gray Scale PDF useful for publishers and writers. Text framing fitting option included. Export to PNG, a lossless transformation for In design Template, which is used in web site design. Cool introductions are made by the After Effect latest updated cs6 features to make the website designing extra attractive. 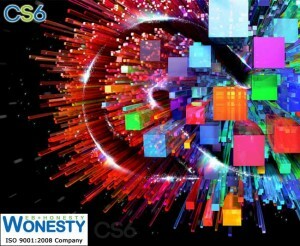 The contents of CS6 help the users to design Graphics, Edit Videos, and Design web Templates easily and faster. Adobe Creative Suite (CS6) is the Latest version released by Adobe. For a Web Design Company it extends its Web Design Service Capabilities. As a web design company Wonesty prefer to use Adobe Creative Suite (CS6) to design the websites. This makes web sites look great and catch the attention of the user/viewer of the website. This entry was posted on Friday, February 8th, 2013 at 1:50 am	and is filed under Web Design. You can follow any responses to this entry through the RSS 2.0 feed. Responses are currently closed, but you can trackback from your own site.